Tart cranberries are sweetened to perfection with orange juice and crushed pineapple. 1. Place cranberries, crushed pineapple and orange juice in a medium sauce pan. Bring to a boil, reduce to medium-high heat, and simmer 10–15 minutes, stirring occasionally. 1. 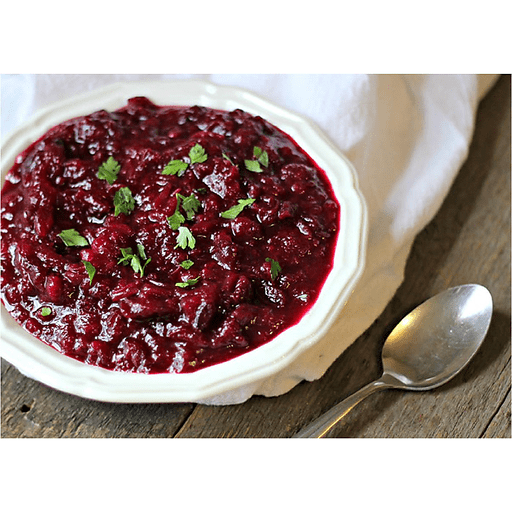 When cranberries burst, use the back of a fork or spoon to smash about ½ of them, so you create a chunky paste. 1. Add sugar, to taste, and allow to cook 10–12 more minutes. 1. Transfer sauce to a glass bowl with a lid and allow to cool in the refrigerator. 1. Serve and enjoy! Calories 60, Total Fat 0g (Saturated 0g, Trans 0g), Cholesterol 0mg, Sodium 0mg, Total Carbohydrate 15g (Dietary Fiber 2g, Sugars 5g), Protein 0g, Vitamin A 0%, Vitamin C 15%, Calcium 2%, Iron 2% *Nutritional values are an approximation. Actual nutritional values may vary due to preparation techniques, variations related to suppliers, regional and seasonal differences, or rounding.